On December 21st, the U.S. Food and Drug Administration’s (FDA) released an Environmental Assessment (EA) with a“Finding of No Significant Impact” on the controversial AquaBounty AquaAdvantage transgenic salmon. The FDA action is widely viewed as confirmation that the Obama Administration is prepared to approve shortly the first genetically engineered (GE) animal intended for human consumption in the face of widespread opposition. Sign the petition opposing the approval of GE fish today! The GE Atlantic salmon being considered was developed by AquaBounty Technologies, and genetically engineered to produce growth hormones year-round, creating a fish the company claims grows at twice the normal rate. This could allow factory fish farms to crowd the salmon into pens and still get high production rates. FDA says escape is unlikely and that the fish pose “no impact” to the environment. But each year millions of farmed salmon escape, outcompeting wild populations for resources and straining ecosystems. Any approval of GE salmon would represent a serious threat to the survival of native salmon populations, many of which have already suffered severe declines related to salmon farms and other man-made impacts. Research published in the Proceedings of the National Academy of Sciences notes that a release of just sixty GE salmon into a wild population of 60,000 could lead to the extinction of the wild population in less than 40 fish generations. Wild salmon populations are already on the Endangered Species List; approving these GE salmon could be the final blow to these wild stocks. The human health impacts of eating GE fish, which would be the first-ever GE food animal, are entirely unknown, but some scientific research raises cause for alarm: for example, some scientists have asserted that foreign growth hormones in transgenic fish may increase production of other compounds such as insulin in the fish. Additionally, FDA has recognized that a transgene cannot be “turned off” once it is inserted in the organism, and will therefore have effects that are uncontrollable. 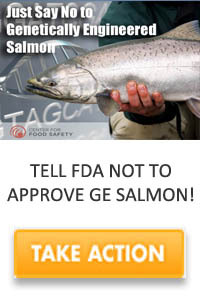 Tell the Food and Drug Administration not to approve GE salmon AND, if the Obama Administration insists on approving these genetically engineered fish despite public opposition, it must require the fish to be labeled when marketed to fish farmers, fish retailers and food companies, restaurants, and when marketed to consumers. Please take action today! The public has until February 25th to comment on this misguided and dangerous action.